Do you have bits of candle wax leftover from projects? 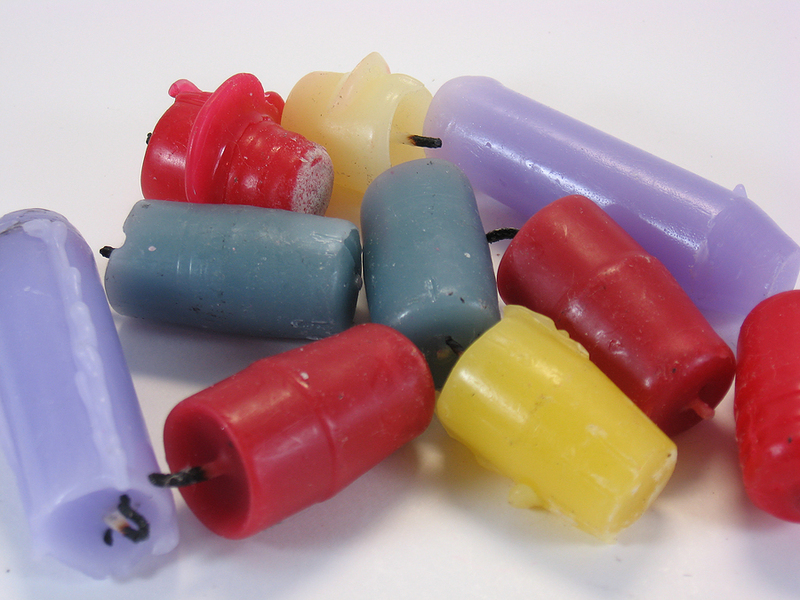 Or do you have unsightly candle stubs lying around the house? Well why not recycle those odds and ends to make some new votives, tea lights or even some seasonal decorative candles. If you are making tea lights, simply press your pre-tabbed tea light wicks into the bottom of the aluminum tea light containers. If you are making votives, use the silicone mold release spray in your votive molds and hold off on placing the wick in the container. Determine the amount of fluid your container will hold and approximately how much of the like scraps you have, so you can prepare enough of your votive or tea light containers. Remove any wicks or decorations from candle scraps. Combine your like candle scraps, and melt in the double boiler making sure not to exceed the recommended melting temperature for the waxes you are using. Add fragrance if you desire. Allow the wax to cool to about 160 to 180 degrees Fahrenheit. Pour the wax into the candle container reserving a small amount to use as a second pour and allow to cool. If making votives, as the wax congeals to the sides, place your pre-tabbed votive wick in the center of the votive mold. The partially solidified wax should hold the wick in place. If the wax has shrunk from the wick, second pour the melted wax over the candle to level the top. Allow the candles to cool completely. Votives should pop right out of the molds if you used the mold release. Trim wick and it’s ready for use.